This is not at all what I want. I want a simple Alt+Tab to cycle through all windows in the current workspace. I do not want unity to create window groups. How can I change this? Note: I do not want at all to use the mouse for this. Back on the manager main window, find and enable the "Application Switcher"
You may also use Alt+~ when you are on a grouped item in the standard Unity switcher to cycle through the grouped windows quickly. When your active window is a terminal that has siblings, you can use Alt+~ directly to switch between the windows of the same application. I find that with this additional shortcut it is easier to switch between applications than with the "standard" approach. Alexander's answer worked great for me. However I ran into the bad UI experience with Application Switcher as mentioned in the comments. 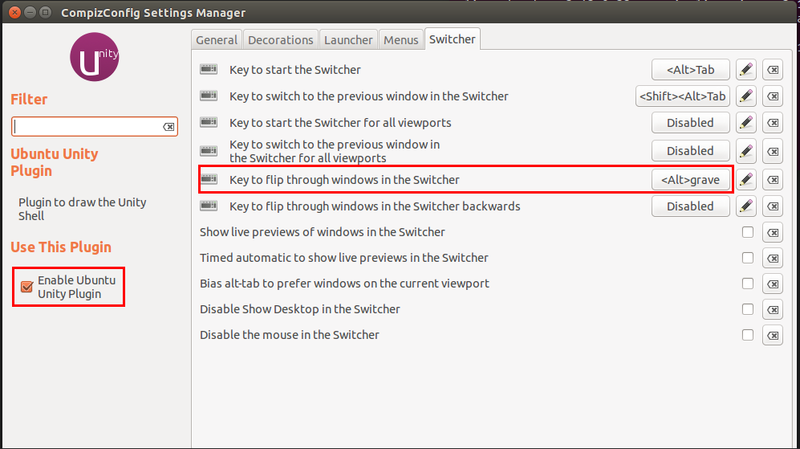 My workaround was to disable other options under Switcher tab in Unity plugin in Compiz advanced settings. How do I turn off alt-tab in Unity? Can I configure Alt-Tab to always switch applications? How to make Ubuntu Alt+Tab smarter? How to disable mouse interference with Alt+Tab?